What would you recommend for students wanting to pursue a similar career? Chopin: Get out there, attend conferences and be open to what is happening around you. Robinson: I would say that one of our greatest achievements, as a team, has been successfully bringing more advanced ecological concepts to the aquaculture food production industry. O'Hanlon: Working miles out, in and under the sea. Being around marine life. Seeing people enjoy our products. Next time you head to your friendly supermarket, stop by the seafood section. Much of what you see on the crushed ice came not from the ocean wilderness but from a farm. With wild fish stocks declining, the world’s population and demand for global seafood soaring, the requests for farmed fish are skyrocketing. Farming fish might seem to reduce pressures off wild stock, wouldn’t it? The answer may surprise you. Fish farming, or aquaculture, already produces nearly half the fish we consume, reports the United Nations Food and Agricultural Organization (FAO). Some call this the “Blue Revolution.”But as the industry explodes, critics argue the gains may not be worth the costs. Just as intensive farming practices on land can pollute and spread diseases—think industrial-scale feedlot waste and Escherichia coli (E. coli) epidemics—so too can irresponsible aquaculture. The litany of past and current grievances is long and extensive. 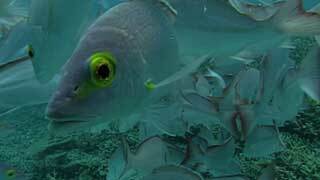 Farming fish releases polluting nutrients, pesticides and antibiotics into coastal waters along with occasional escapees that can genetically weaken wild stock. Fish parasites, called sea lice, can spill out of pens and jeopardize wild species. Of greatest concern is that farming carnivorous fish, like salmon and snapper, requires fishmeal, which is derived from wild fish—an increasingly finite resource. In a typical salmon farm, many pounds of wild fish are used to make one pound of farmed fish. And as demand for these carnivorous fish increases, so too will demand for their wild-caught food. All these woes underscore the fact that we’re still on the steep side of the learning curve when it comes to global aquaculture. Science and effective regulation have simply lagged behind booming entrepreneurship. Progress will require innovation from all directions. Canadians Thierry Chopin and Shawn Robinson are working with the salmon industry to encourage the creation of “whole ecosystem” farms. These farms involve multiple marketable species instead of single-species farms—an idea that stems back to ancient Chinese aquaculture techniques. Scientists call this type of farming Integrated Multi-Trophic Aquaculture. “What we are doing is relatively simple with salmon, mussels and seaweed,” Chopin states. “We will make it a little more complicated with sea cucumbers, sea urchins, worms and all these things. But really, it’s nothing more than recreating a balanced ecosystem.” And this design has added benefits. According to Robinson, farming filter-feeding shellfish alongside salmon not only significantly reduces waste that spills out from the fish pens, but also the possibility of virulent diseases like infectious salmon anemia. Reports from Norway’s Institute of Marine Research, suggest the blue mussel, Mytilus edulis, can consume and inactivate the anemia virus with no ill effects to edibility of this shellfish. 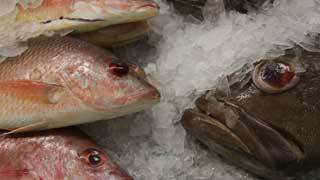 Think about the fish you buy and make wise choices at the market. The Marine Stewardship Council, Seafood Choices Alliance and other organizations can provide valuable insight into the lives and costs behind farmed versus wild-caught produce. See our interactive market for details. Consider limiting your consumption of fish or purchasing herbivorous fish like Tilapia, carp and catfish. These species do not require wild fish in their diets and thus can provide a net gain in global fish numbers instead of a net loss. Support fish farming policies, fisheries management and exporters that keep the health of the whole ecosystem in mind. All aquaculture requires healthy clean water supplies in order to flourish. Without clean water, we can’t have clean fish. For more solutions visit: What can we do? Skar, C. and S. Mortensen (2007) Fate of infectious salmon anaemia virus (ISAV) in experimentally challenged blue mussels Mytilus edulis, Diseases of Aquatic Organisms, 74: 1—6.